In our household growing up, we weren't allowed to leave the dinner table until we had finished our dinner. That meant that when salmon was on the menu I would sit there for an awfully long time. I remember many occasions where I would plug my nose, take big bites and try to swallow quickly before reaching for my water in order to prevent tasting as much as possible. It's safe to say I hated salmon. Today…I look forward to ordering the oily fish whenever possible. I'm sure growing up had something to do with my change of preference, however, I also think that learning about the benefits of Omega 3's played a huge role in my determination to enjoy fish. Salmon is a highly nutritious food! We're going to assume that I mean wild caught, Alaskan salmon because there are a host of concerns and health issues surrounding farm-rasied anything (be on the lookout for a Farm vs Fresh blog post - it's a big deal). - A 4 oz serving contains a full days requirement of Vitamin D and over half the daily requirement for B12. - High in Omega-3 fats. Omega 3's reduce inflammation in our bodies. Inflammation is turning out to be at the base of many health problems, including heart disease, diabetes, some types of cancers and arthritis. Omega-3’s also help prevent the blood clots which cause many strokes. Omega-3 fats have also been shown to have the potential to slow cognitive problems such as Alzheimer’s disease and age-related cognitive decline. People who have sufficient levels of Omega-3’s seem to have less depression, aggression, and suicide risk. Omega-3 is termed as an essential fatty acid because the body cannot synthesise it itself and must be obtained from the diet. Aim to eat oily fish - such as salmon, mackerel, sardines, herring and fresh tuna - at least three times a week. - 2 TBSP. coconut oil, butter or ghee. 1. Set oven to a low broil setting 2. Place thinly sliced pats of butter (or fat of your choosing) in the bottom of the baking dish 3. Place salmon in the dish and sprinkle with rosemary, sage and sea salt. 4. 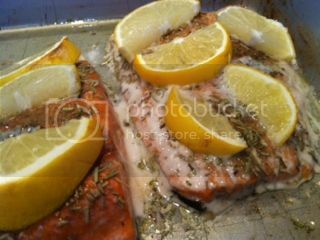 Add more thin pats of butter on top of the salmon filets and top with slices of lemon. 5. Broil on low for 10-12 minutes or until salmon is cooked to your liking. ** Note: If you don't have a broiler, you can bake salmon at 350 degrees F for 10-15 minutes for similar results. In review: I was really pleased with how my salmon came out. I enjoyed the lemony fresh flavor, paired with roasted broccoli and brussel sprouts. I was surprised how hassel-free this recipe was. I purchased frozen, Wild Alaskan filets (watch out - they are pricey) and defrosted them in the fridge over night in preparation of making them today. Dinner in 15 minutes! BAM. What oily fish do you plan on making this week? Newer PostThe Best Foods To Eat. Ever.